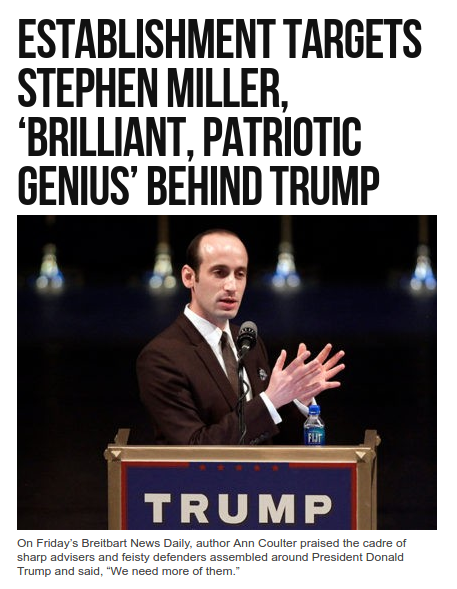 An article in Breitbart about Nazi Stephen Miller is not surprising. But saying AnnThrax Coulter is a Breitbart contributor? How the disgusting have fallen. One of the Breitbart drones, John Hayward, uses a good SEO technique to boost the site, writing about one of his colleagues. Ann Coulter? Hayward claims AnnThrax is a Breitbart contributor, but there’s no link to any of her work for the site. No matter, he’s essentially dropping a name to beat his drum. Or whatever else he was beating when he wrote this article. I really thought I was done with Breitbart when my friend Lamar gained fame for killing the turd with a tweet back in 2012. We Democrats were riding high, working to put Barack Obama back into the White House for a second term. Like most of what has now become known as the “alt-right”, the writers at Breitbart were a bunch of whining racists, looking for something to latch on to. Breitbart himself was never that person. He had more money than the average wingnut blogger, and a lot of free time to promote himself, but there were others. Son of Erick was getting teevee-pundit gigs, and other leaders of the conservative crazy overshadowed him. Most assumed his death would cause his site and infrastructure to fold. “I was describing Steve Miller to some reporter recently. I was on a plane at the time, so I was writing out adjectives, and at the end of the sentence, I said, ‘I’m not just listing adjectives; I’m actually pausing and thinking about each one. But the main ones are brilliant and patriotic,’” she recalled. Of course, our friend Hayward here didn’t actually discuss this with AnnThrax. He’s quoting an article by talk show host Alex Marlow. He provides no links back to Marlow. Guess he isn’t a Breitbart contributor.